Thank you to The Morning Call for continuing support of our non-partisan, twice-yearly Voters’ Guide. For more information about the Voters Guide, please go to “Current Election“. 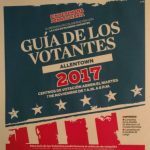 Last fall, we were proud to help distribute “Guía de los votantes Allentown,” the inaugural Spanish translation of the Voters Guide. 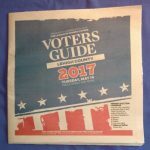 We also post the information from the Voters Guide online. Check back soon for the link to the online Guide. The League of Women Voters of PA offers an online voters guide called Vote411 to all Pennsylvanians. Reminder: The League of Women Voters helps people register to vote, but we DO NOT maintain the lists of registered voters. If you have a problem with your registration, contact the Lehigh County Voter Registration Office at 610-782-3194. To help voters in Lehigh County to register and vote our League wrote “A Guide To Registering And Voting In Pennsylvania For The New Voter.” Thank you to members Ann Bartholomew and Pat Swan as well as Timothy A. Benyo, Deputy Chief Clerk, Registration and Election, Lehigh County, wrote the pamphlet. Click here for the printed copy. NEW! From our League, for eighteen-year-olds and new citizens who speak Spanish: “Guía Para Registrar Y Poder Votar En Pensilvania.” A big thank you to Beverly Hernandez, then-President of the League of Women Voters of Northampton County, for translating. Click here for the printed copy.